20.00 The performer shows an empty hat. Next he displays an empty glass and tells his audience that he will put the glass into the hat, which he does. Apparently absentmindedly however, he removes the glass from the hat and sits it down on the table in full view. Next he proceeds to pick up another glass filled with liquid and actually pours the liquid right into the hat. Suddenly he "discovers" that he forgot to put the glass in the hat. He immediately places the glass into the hat and immediately brings it right out completely filled with the liquid! The hat is dry and completely unharmed. The magician can also use a basket, box, lady's purse or any other receptacle. Long off the market, the Illusion Warehouse is happy to bring this neat effect back from the 1950's! Comes complete with special glass and instructions, use your own hat or other receptacle. 35.00 The magician displays a chrome cream pitcher, like something to keep cream in for coffee. He pours liquid into the pitcher. Then amazingly he turns the pitcher upside down and the liquid has apparently vanished! 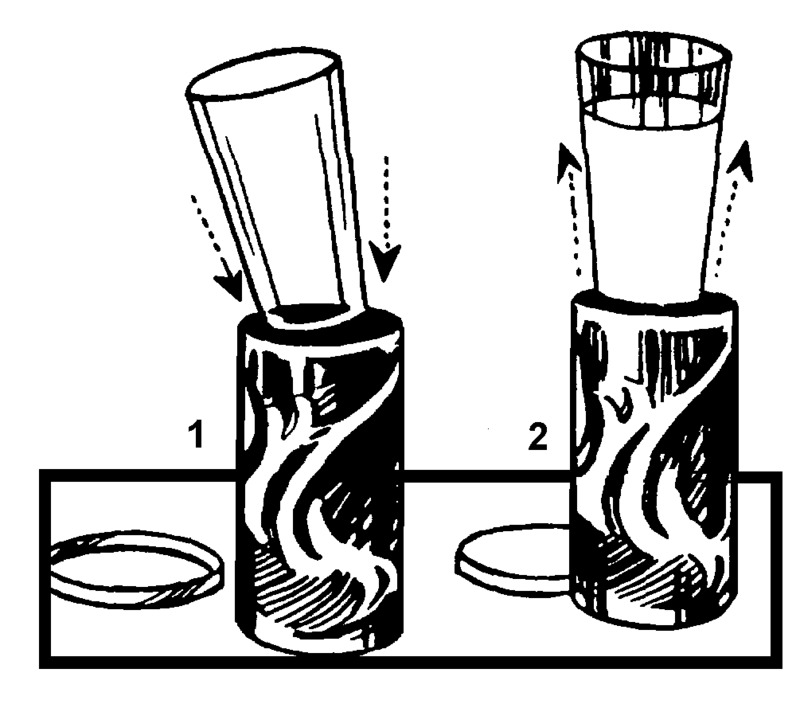 The magician can even insert a wand or stick into the container and rattle it around to prove the liquid's disappearance. 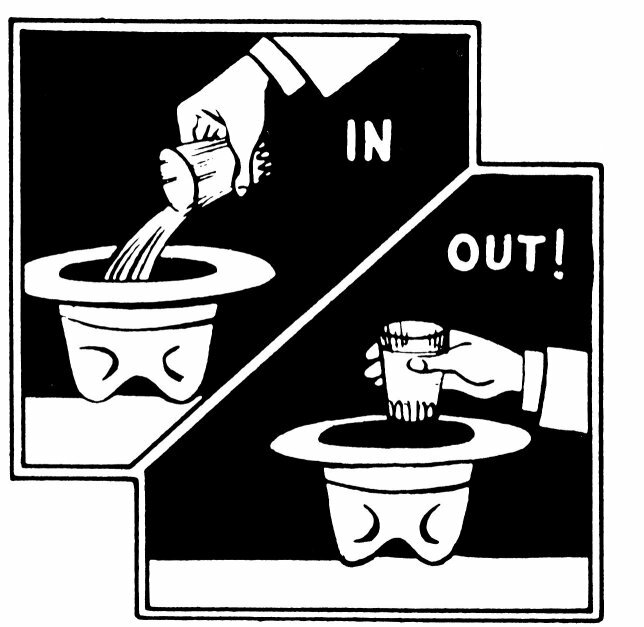 The magician removes the wand, turns the pitcher back upright, and suddenly the magician can once again pour the liquid out of the pitcher! 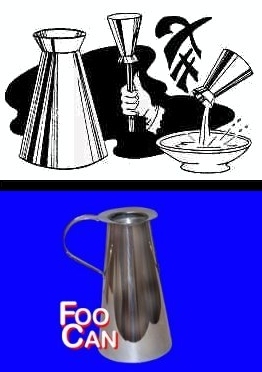 Use the Foo Can to vanish liquid or make it appear. Use it as a type of Magic Milk Pitcher. 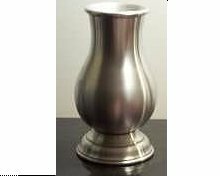 This great prop is made of chrome plated metal and very well constructed. 20.00 Talking about the difference between science and magic, the magician offers to demonstrate. He produces a bucket of colored water, an ordinary drinking glass, and a piece of paper. He uses the glass to dish up a couple of glasses of liquid and then pours it back into the bucket to show that all is fair. One more time he dishes up a glass of water. He then takes the piece of paper and dips it into the bucket of water to wet it and then proceeds to cover the glass with the paper. The the magican turns the glass with the covered opening upside down! The liquid does not run out and it appears that the paper is working like some sort of stopper or lid for the glass. "That is science" says the magician. Slowly the magician peels the paper away from the upside down glass and still the liquid does not pour our! "That is magic!" says the magician. Then at his command, the liquid suddenly gushes out of the glass and back into the bucket! 35.00 Long off the market, the Illusion Warehouse is proud to re-introduce this classic liquid effect. 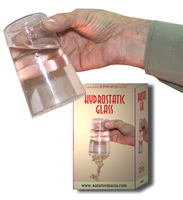 The magician displays what appears to be an ordinary clear drinking glass. He takes the lid off a container, drops the empty glass inside, and once again covers the container. When he opens the container and removes the glass, the glass is now full of milk or any other liquid! 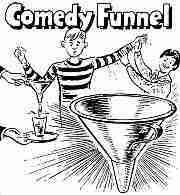 Or for a comedy routine, the magician blows up a latex glove so that it looks like a cow's udder. He milks the fingers and when the magician removes the glass from the container, now it is full of milk! The uses of this quality product are limitless. It is ashame great old magic like this has been forgotten by the newer generations. 35.00 A cone is formed out of newspaper or other paper material. 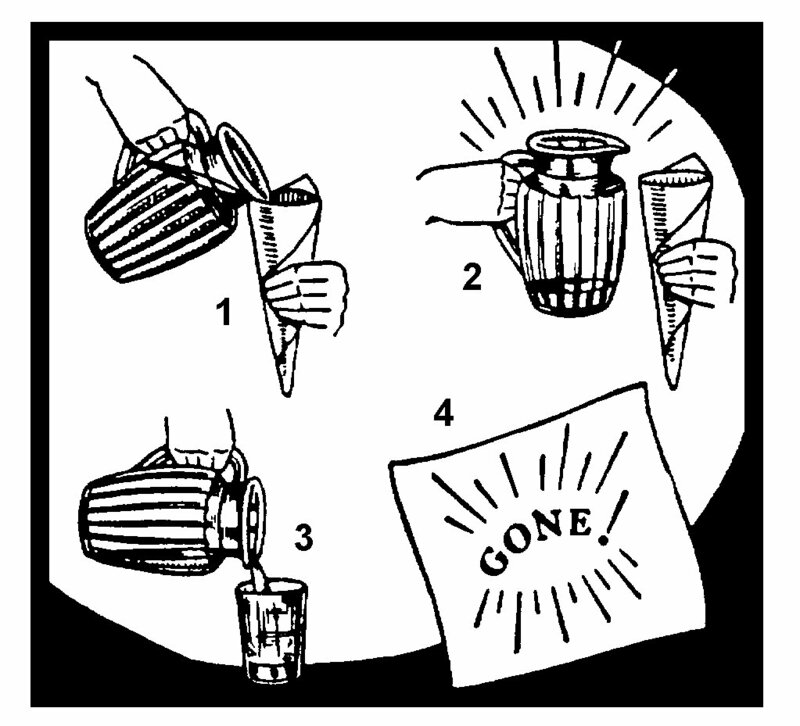 A pitcher of milk is introduced and most of the milk is apparently poured into the cone. When the cone is opened the milk has vanished! 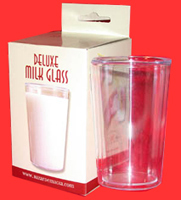 A classic magic effect, our version is a real plastic pitcher that has been cleverly gimmicked. Use your own cone that you can easily make out of newspaper or decorative wrapping paper. NOTE: These are the well-known glass milk pitchers of yesteryear that were made to work! Do not confuse this product with the poorly made plastic pitchers sold by many magic supply companies that are made in India and China. 40.00 The magician displays a tea kettle and five empty clear drinking glasses. The magician fills each of the first four glasses from the kettle, but each glass fills with a different colored liquid; red, yellow, blue, and then green! 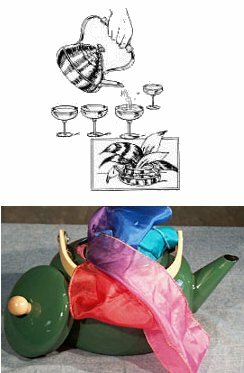 The magician then reaches into the kettle and removes beautiful silk handkerchiefs! Finally the four glasses of colored liquids are poured back into the kettle and the kettle now pours clear liquid into the fifth glass! Comes with kettle and complete instructions. Silk hanks and ordinary drinking glasses not included. Note also that the manufacturer periodically changes kettle colors.